This sleek Windows 10 convertible will also support new S Pen features. Samsung may not be ready to unveil the Galaxy S8 smartphone just yet, but it still has some shiny new hardware for us here at MWC. In addition to the Tab S3, the company is showing off two new hybrids, both called the Galaxy Book. They're 10- and 12-inch Windows 10 tablets that support new S Pen features and come with keyboards. They're well designed and offered brisk performance during a brief hands-on. 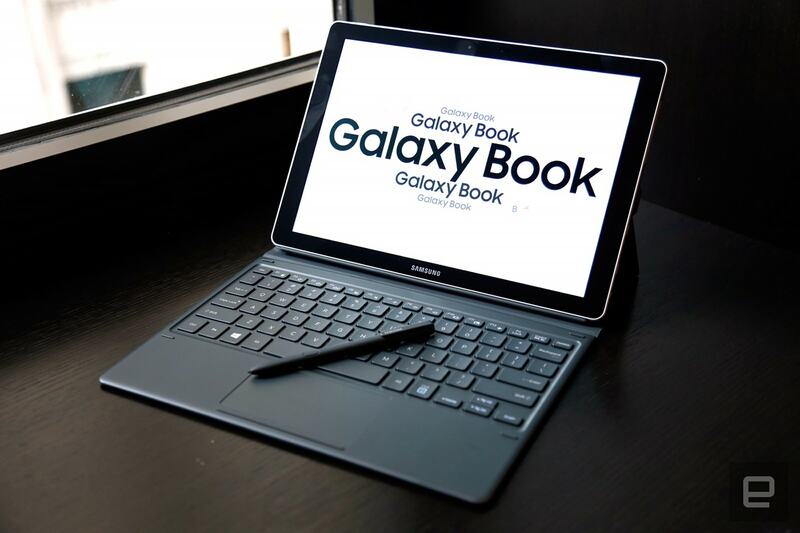 And, apart from the S Pen support, there are a few other, more subtle features that differentiate the Galaxy Books from rival Windows 10 convertibles. The larger Book is the more full-featured and compelling option of the two. Despite its relatively svelte 7.4mm profile, the 12-incher sports Intel's latest Kaby Lake Core i5 processor, an LTE radio, 4GB or 8GB of RAM and a 128GB or 256GB SSD. That's pretty promising, performance-wise, for a convertible tablet that's this portable, although it's important to note that the 10-inch unit comes with a Core M processor instead. When bundled with its included keyboard, though, the 12-inch Book still felt somewhat hefty when I picked it up, but not much heavier than a comparably sized laptop. Like the just-announced Tab S3, both Galaxy Books will support the new S Pen, which can detect up to 4,096 levels of pressure sensitivity with its fine 0.7mm nib. S Pen fans will find some familiar features here, such as Screen Off Memo and the Air Command shortcut menu for outlining screenshots and annotating PDFs. A new function that Samsung believes will excite artists and designers is the pen's ability to understand the angle at which you are tilting it. So, say you're holding the stylus at a 60-degree angle from the screen. Compatible programs, such as Adobe Photoshop, can integrate that slant into your brushstrokes. During my time with a pre-production device, this didn't work very well: Photoshop thought I was holding the brush upright, even though I was holding it horizontally. 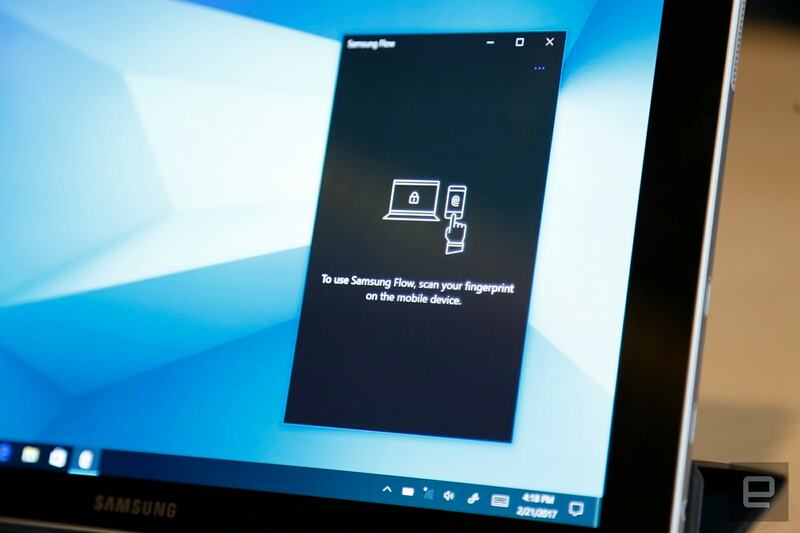 Another feature that Samsung has brought over from its phones is its Flow software, which lets you get smartphone notifications on your laptop's screen. Flow also makes it easy to share files across Samsung devices, or remote-control each other. With a 2,160 x 1,440 AMOLED display, the 12-inch model should also provide enjoyable multimedia playback and gaming. And Samsung has brought the HDR support its TVs offer to the larger Book's screen, giving it a wider color gamut that makes videos and images more vibrant. Of course, the content itself will have to be in HDR, which means you'll have to hunt for videos and photos with that effect to truly see the difference. It was definitely noticeable during my demo, where an HDR video looked richer and had higher contrast than the same clip without. Unfortunately, that's just on the 12-inch Book. The 10-inch version uses a full HD LCD display that doesn't support HDR. Because they were designed to be portable, the Galaxy Books also sport generous 30- and 39-watt-hour batteries on the 10- and 12-inch flavors, respectively. Samsung says these will last approximately 10 hours, and thanks to quick-charge support, you shouldn't have to wait too long to get back to 100 percent. Of the two new tablets, the 12-inch is clearly the more compelling option. It has the superior screen, a desktop-level processor and a slimmer profile. But it will surely come at a higher price than its little brother. Until we know the exact price, and where these hybrids fit into the market, the new S Pen features make Samsung's Windows convertibles slightly more useful than before, but we'll have to spend more time with the devices to know if they're truly worth considering.